You can contact us during regular business hours (8AM-5PM Mon-Fri) by phone, or by email at support@cinglenet.com. You can reach the owner directly at 256-603-6582 or mark.burcham@cinglenet.com. Cinglenet is a Better Business Bureau Accredited Business. 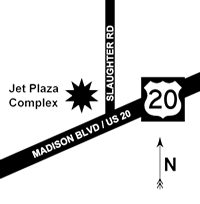 We are located at 7734 Madison Blvd STE 105, Huntsville, AL 35806. We are located in the North building, bordering Slaughter Rd - entering through the right-most door, we are on the right of the hallway a few doors down. Providing quality internet & engineering services to the North Alabama area since 1998. Guaranteed one-hour call-back time for contracted customers, or it's free. We'll call back to your support request in an hour or less; otherwise, you won't be charged for service. And if you're a first-time customer, your first assessment visit is free. We'll support you, whether you want a contract or not. Instead of being a fixed-detail or fixed-rate service, we work with businesses to determine the most cost-efficient way to support them. We value our customer's time as much as we value our own. We offer secure remote backup of your files to our physical site, stored under lock & key, as well as a local backup on your end. You'll have two layers of protection in the event of data loss. We'll set up your network of routers, switches, CAT5/6 lines, servers and workstations, and make sure it stays secure, with VPN implementation, encryption, and local and remote backups. We'll host your email service and website combined for $50/month, whether you want additional service or not. We will also design, fix, or make upgrades to your website for a competetive price.